Today we are interviewing Robert C. Stone author of the business fable "Circle of Wisdom: A Path for Life, Mind and Leadership." I grew up on stages and at Chamber of Commerce meetings. “Somehow” I developed passions for leadership and public speaking. I’ve also been an osteopathic physician for twenty years specializing in psychiatry. About ten years ago, I saw the intersection between the challenges of working in business team settings and my work, particularly with trauma survivor populations. The latest cognitive therapies are based on modern neuroscience interpretations of ancient teachings designed to decrease suffering and seek the wisdom we all have inherently available within us. About this time I was invited to give my first week-long Fortune 500 training in Wisdom Leadership. It was an intense and life-changing experience. A decision I made at that time was that the best way to transmit this knowledge, this process, was by telling it as a story. This book is that story. Stories give readers the opportunity to resonate and absorb as they are ready. They can discard and keep as they choose, then re-read at the right time. Since giving that initial training, I have promised though various media to more than 4 million people that I would make this book available to the public. Now seems to be the right time to make good on those promises. What I won’t do here is talk about these principles. That’s the story’s job. I will let you know that this is not just a theoretical path, though. I have tested, honed and proved on my own and with many talented peers the effectiveness of the Circle of Wisdom in developing new business teams, healing broken corporate and agency systems and ‘turning around’ a large state healthcare program strangled for years by typical bureaucratic practices. My first leadership role was as a manager for an AMC Theater in Dallas while I was still pre-med. During medical school, I co-founded Education Research Laboratories, Inc., which became an Apple award winning innovator and one of the first producers of handheld medical references. And the process continues, the path goes on. Three managers at a modern ranch try to endure the latest consultant the owner has brought in to fix things. But this time, it’s different. It’s personal. And not everyone may survive. It was written for Fortune 500 upper management but has been used by psychotherapists, hospital administrators and trauma survivors. Anyone who wants to add the power of Wisdom to their lives, whether personal or business. What inspired you to write a book about wisdom in leadership? A friend of mind remarked one day about the similarity of working with some of my trauma survivors and the problems his company was facing. After just a little reflection, I realized he was right and my parallel paths of psychiatry and leadership became joined. This happened during an intense period of Buddhist study, which was the piece that brought it all together. Why did you decide to use a parable of animals managing a ranch to tell your story? There is no getting away from Orwell if you decide to write about animal characters, and that’s OK. The animals allow us to see into characters with less defensiveness than if they are written all as humans. Then we are free to see as much of them in ourselves as we are ready to see. It also helps transform a very complex and deep wisdom path into a process that we can all understand and implement at our level of courageous honesty. In your book, the path of the Circle of Wisdom is a central idea. Can you elaborate a bit on this idea? I will never forget the day that I was finally outlining the path itself and I realized that the last part of the last step was the exact same as the first part of the first step. I yelled out, “It’s a circle!” And so it is. Problems have within them the solutions if we can look deeply enough within them and within ourselves. But every solution is also guaranteed to bring problems. If we don’t understand this reality, we will eventually try to stop and rest on our successes which will then stagnate and potentially fail if we do. Neither problem nor solution is good or bad in itself. It’s just the process necessary to bring wisdom into all of our actions, reactions and decisions. What do you think are some of the biggest misconceptions people have about wisdom in leadership? That it’s something someone else can give you. How has your career and life experiences influenced your writing? Well, my parents were Shakespearean actors, as well as active in the business community and teaching. So it’s in my DNA to start. In my profession as a psychiatrist, I have learned the power of story. It’s a power that can destroy and create. It must be wielded wisely. For the first decade, my practice was primarily survivors of severe trauma, torture and combat. That intense exposure to the shadow of humanity drives me in many ways to write. It eventually led me to get my MFA in Creative Writing. Modern Authors that just spring to mind quickly are John Irving & Michael Chabon. Many of the canonical writers. I did my MFA in Poetry. The number of poets is too long, but they got me through med school! Also some modern Buddhist writers. Can you tell us a bit about your creative process, from the initial idea to the finished manuscript? Entirely different for each genre. I wrote my first novel for my kids. Just started in one day during my residency and cashed in on a decade of studying story. Similar for my first screenplay. For short stories and poems, I often write them for a purpose, as a gift or to memorialize an event. Poetry is more of a practice for me now that I’ve studied it formally. I published my first 20 scientific/medical papers while I was still in med school. I like that kind of writing as well. Putting very complex concepts into a simple expression that makes the complexity accessible to more readers. How do you hope readers are impacted by your book? I guess primarily by taking a breath, realizing that all the ‘stuff’ going on inside them is OK. Then working on being able to look closely at it without judgment and harnessing the power that comes from that to direct their lives and possibly the lives of others in meaningful and beneficial ways. I thought I’d be a holdout. I still love having a physical book, and some types of research still workout better with paper, but I’ve totally converted to reading on my iPad or iPhone. It’s always available, and with the current screen technology, I find it even easier on the eyes and a very pleasant experience. Any writer who tells you they like writing is probably fibbing, at least a bit. I think Dorothy Parker nailed it with, “I hate writing, I love having written.” I think this applies when you’re writing from and about the heart. When you’re writing to mean something, or say something that probably can’t be put into words. It’s rough. It should be. But it sure feels good when it’s done. A sheer sense of accomplishment that somehow transcends any misery the moment might be bringing. Primarily I write on the computer but I do like writing poetry with pen and paper too. Something about slowing down the thought process a bit. 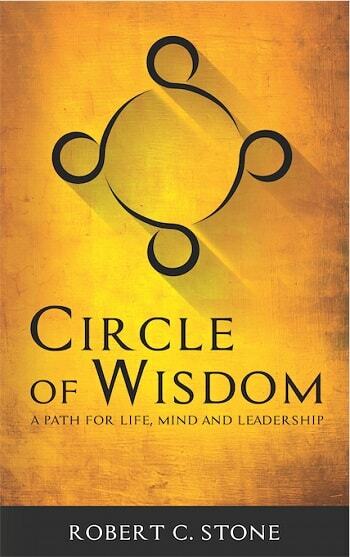 I have two 40 page outlines of the non-fiction business partner books for "Circle of Wisdom." It would be stupid not to write them. But I have a burning fiction series that has to get started or I’m going to irritate everyone at home beyond capacity. One of the beauties of following a Wisdom path is that there is no proselytizing, no selling anything or trying to convince anyone of anything. So I was able to write this book with the idea that people can take whatever works for them from it. It’s a way, not a religion. Oh, and I’m very excited that I will be getting the audiobook this month read by P.J. Ochlan! Google him. He’s an amazing screen and voice actor. He does these amazing character voices, and he completely ‘got’ Circle of Wisdom when he read it. My discussion with him before his recording was a highlight of my journey with this book. Pek laughed bitterly on his way back to the hen house. He loved the expression on Ruf and Nay’s faces when he greeted them with that “Namasté” garbage. But what he loved even more was how gullible OM and Dal were. They really thought he’d bought into their plan. Fools, fools, fools! When he looked back on things, he saw that OM had given him other opportunities to take charge in the past – but none were as wide open as this one. Pek was going to prove to OM that he had leadership tools way beyond anything some llama could teach. He was going to show that he had the skills to rule over much more than a stupid bunch of hens. He turned in circles, looking at all the hens. His eyes blazed. The hens quieted some, but not nearly enough. “I mean it. Shut up right now!” he screamed at the top of his beak. What is up, he thought. Yesterday I only had to yell once. How mad do I have to get to command their attention? “You’ll get your recommendations, Pek,” Lucinda said tersely. “Then everything will be fine,” Pek said, turning away.